With exposure to an infinite number of potential customers, vehicles provide a highly effective means of advertising your goods or services. Vehicle signs and graphics for cars and vans is an affordable, cost-effective method of getting your business noticed on the road. 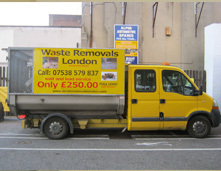 We design and produce high quality graphics to ensure your vehicle promotes your company effectively, 24 hours a day. 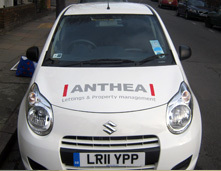 Essentially there are two main approaches to vehicle livery; one involving the application of cut, coloured vinyl and the other, the application of printed vinyl. Combinations of the two are also popular. We are very experienced and capable in both approaches. Our proficiency in all aspects of design allows us to tailor solutions to meet your specific needs, whilst taking account of budget, goals, technicalities, and methods. When you have your car wrapped by us you benefit from having a car that looks completely unique but also benefits from an extra layer of protection that stops scratches from occuring. Cut coloured vinyl signs are the most popular for vans and vehicles where lettering and basic logo shapes -- consisting of areas of solid colour -- are required. That said, there is a lot of scope for creativity with cut vinyl. 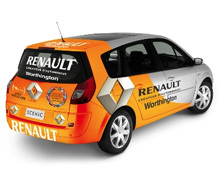 Printed vinyl graphics for vehicles, and outdoor use generally, are laminated in order to protect the vibrancy of colours and materials used.